The Estate of Harriett McCrocklin recently donated the balance of her husband’s papers to the LBJ Museum. James H. McCrocklin served as President of Texas State University from August of 1964 to April of 1969. During his tenure President Johnson spoke numerous times in San Marcos including the keynote address at McCrocklin’s inauguration November 20, 1964. President Johnson’s speech declared the War on Poverty and the creation of the Job Corps with a campus in San Marcos at the former Gary Air Force Base. A digitized copy of the 16mm reel to reel tape was included as part of the gift to the Museum. Other film includes a copy of the signing of the Higher Education Act on November 8, 1965 and three and half hours of audio that was an Oral History of LBJ, April 13, 1966, compiled by Bruce Roche, Head of the Journalism Department in 1966 at Southwest Texas State University. Jim McCrocklin also provides an Oral History of what went on behind the scenes up to, during and after his inauguration in 1964 explaining how the University acquired the United States Federal Fish Hatchery from the Department of Health, Education and Welfare after the Department of Interior had designated it as surplus property. There is also a lot of information pertaining to the newly created Job Corps and its performance. This gift has great historical significance and further educates the public as to what a dedicated and gifted man President Johnson was. It underscores his goal of eliminating poverty through education. 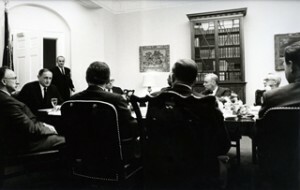 Some of the other items include letters exchanged between Jim and Harriett McCrocklin and LBJ and Lady Bird; calendars and notes of meetings while McCrocklin was Under Secretary of the Department of Health, Education and Welfare, and a United States Delegate to the United Nations Educational Scientific and Cultural Organization, U.N.E.S.C.O., at Paris in 1968. There are a large number of photos of President Johnson, various members of the cabinet, and other political dignitaries. One of the more unique items in the collection is a bronze statue of President Johnson on horseback. 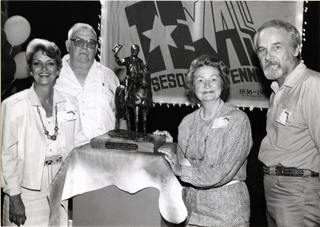 This statue is the only copy of a bronze that was created by sculptor Cie Conway and presented to Lady Bird Johnson on the 20th Anniversary of the signing of the Higher Education Act on November 8, 1985. A framed copy of McCrocklin’s Under Secretary HEW flag is also on display at the Museum. Harriett McCrocklin made her initial gift to the LBJ Museum of San Marcos in August of 1998 and these items complete the delivery of the family’s extensive collection of LBJ artifacts and memorabilia. The original McCrocklin papers included a large number of photos of the 1965 Presidential Inauguration and parade, 16mm film, papers and more. Photos of the President and Mrs. Johnson viewing the parade headed by the Texas State University band presently hang in the Museum. These items are presently being catalogued and will be presented as a special display at a date in the near future.